The Georgia State Capitol in Atlanta. Women lawmakers work together to get business done, despite partisan divide. Orrock was elected to the House in 1987. Unterman was elected in 1999. 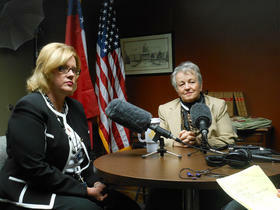 “We are still working together,” Orrock told O’Hayer in an interview on Monday at the Capitol. “Women are known collaborators, communicators, and not so interested in getting credit, but getting the job done,” she explained. Orrock pointed out that she and Unterman have a long history of successful collaborations. “We’ve always understood that, of course, we’re in different parties, and there’s places where we’re not going to agree, but we have so much in common, in terms of our commitment to health policy and good sound public policy and have worked, I would almost say, on countless issues together over the long-term,” Orrock said. The pair have collaborated on a variety of healthcare initiatives over the years. “It’s not just health policy, it’s social issues, too. And those are issues that are really not partisan type issues. They’re easier to cross the party line versus tax issues or finance issues,” said Unterman, the chairwoman of the Health and Human Services Committee. As an example, Orrock and Unterman talked about a bill Orrock sponsored this year. SB 109 would set up a form for doctors to sign, acknowledging that they understand a patient’s wishes for care at the end of life. Orrock said Unterman gave her critical assistance in getting support from groups which normally oppose Orrock’s bills. Unterman credited Orrock for her willingness to include people who are often her opponents on social issues. The bill passed the Senate by unanimous vote, and, at this writing, is headed to the House. Denis O’Hayer contributed to this report.